This is the perfect example of why I love breakfast so much. 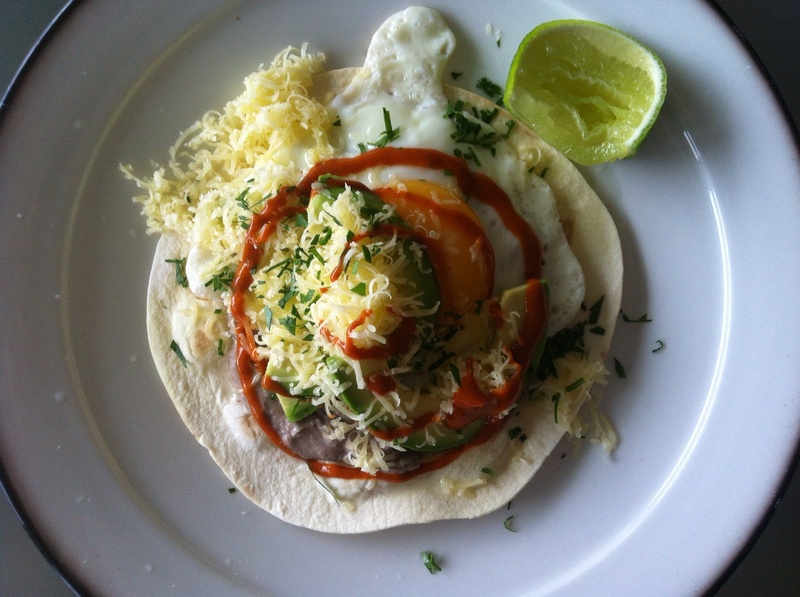 Ranchero breakfast tostadas – another one from, The Sprouted Kitchen. I made these on the long weekend for a lazy Sunday breakfast, that could have easily turned into huevos rancheros for brunch, lunch or dinner. They were the perfect ‘any meal’. The rain had set in across Hardys Bay, making it impossible to see beyond the shores edge. Something had to brighten up this grey and misty mood. Something just like a warm flour tortilla topped with cumin spiked black bean mash, a runny fried egg, fresh avocado, cheese, coriander and hot chilli sauce (the hot chilli sauce that I’m obsessed with) and a squeeze of lime. A satisfying plate to fill, inspire and awaken our senses. Cooking the black beans is the only time-consuming part of this recipe – but you can cheat like me and use a can of them (even the refried black beans if you can’t be bothered with mashing). The original recipe calls for bacon in the bean mash, but I omitted this from my creation because we didn’t have any at home. And to be honest, the beans have such a nice meaty taste and texture to them, it wasn’t missed at all. With the washing up done, and the rain easing to just a drizzle, we headed to the beach to take the restless dogs for a walk. It was warm enough to still be in shorts and thongs and I ditched the umbrella. I love walking in the rain. The inconsistent gentle drops of water, some soft, some hard – each one a peaceful cleansing. A pod of dolphins greeted us at the beach, and followed us along as we walked – 20 of them at the least (and I was blissfully incommunicado otherwise I would have snapped a shot of them on my iPhone), frolicking in the waves. Just magic. 05 Feb	This entry was published on February 5, 2013 at 1:05 pm. It’s filed under Lucy's plate, Recipes, Uncategorized and tagged Breakfast, Mexican, Sara Forte, The Sprouted Kitchen. Bookmark the permalink. Follow any comments here with the RSS feed for this post. yum that looks delicious especially with the cloud of shredded cheese and a squeeze of lime!